How do you identify gold when you are prospecting? 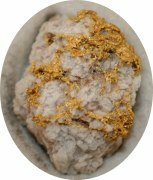 What's the difference between eluvial, alluvial and Primary Gold? Is necessary for you to find gold in WA - or anywhere else for that matter. Research methods and resources so you can use to find and target your own gold areas. Even with this limited overview you will be better off than many people who turn up in the middle of nowhere in WA with hope in their heart about finding the "Big One" but no knowledge - Nothing in life works that way! A beautiful specimen of gold in Quartz. Nothing excites a gold prospector more than the chance of finding a big piece of gold. Big gold nuggets are a rare object these days but it is still possible to find a decent size gold nugget in Western Australia. The 2 and 1 ounce gold nuggets found by Bill late in 2009 was in an area hammered by metal detectorists. The largest nugget found in WA was "The Golden Eagle" found at Larkinville in 1931 of 1135 troy ounces. Even in recent times large nuggets are still being found in WA. IN 1992 the "Evening Star" nugget of 520 troy ounces was found at Kalgoorlie. 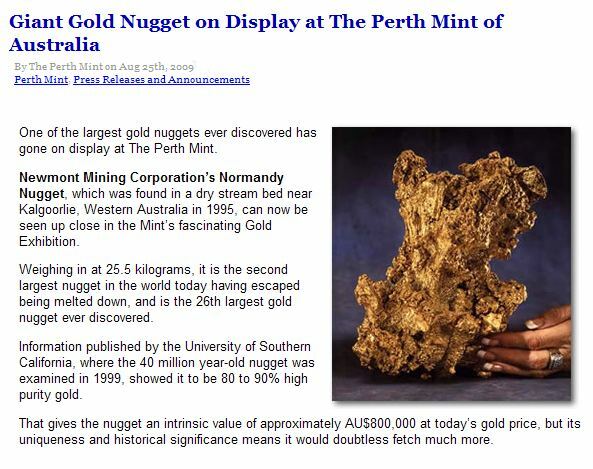 Here is a link to a news item about nugget found in Kalgoorlie in 1995 and on display at the Perth Mint - The Normandy Gold Nugget of 25.5kg. Gold can be found in powder or dust form right through to massive nuggets of almost pure gold. Gold can be found in Specimen form which is gold enclosed or attached to other material such as the Quartz specimen pictured above. Gold can also be found in crystal form with distinct well formed crystal faces but this is much rarer than the compact nugget form. There are standard mesh sizes for classificaion of gold nuggets by size. This can range from Flour or Flake gold from 20-25 mesh through to Coarse gold and you can buy rock particle classifiers that provide the mesh sizes for gold. Australian Gold Nuggets sell for $US75 per gram. Obviously, these prices will change as gold prices fluctuate. The link is provided as an example of gold size classification and the impact on price. This will be discussed further in the buy and sell gold section but be aware that gold nuggets can achieve a premium on spot gold price. Gold nugget size and purity will also impact on what price you can sell your gold for in some markets. Here are some important links to other pages on the site. Just a quick note on the weight of gold, it is measured in TROY ounces or grams. We have temporarily removed the calculator from the website until we can access a convertor that links to a Https website. This is to enable our website here to become Https. Don't worry your e-mail address is totally secure. We promise to use it only to send you Gold Prospecting e-News. Return to Home Page from Gold Nuggets page.